More recently, a number of my friends have been sharing some of their favorite wines with me. At the same time, I’ve also shared some of my favorites with them that they have not tried. The 2005 Pasterick Vineyards Syrah was gifted to me by Alan who is a customer and friend of mine; and who also enjoys wine. In return, I had shared a 2009 Gamble Family Vineyards Old Vine Syrah with him, which we think is really good and I plan to post my tasting notes in the future. We had arrived home recently from another work and pleasure trip in California and it felt good to be home. I was feeling a bit worn out as our trip home was long and I was tired from attending many presentations during the week. It’s hard to believe, but one does get tired just sitting in a room listening to presenters for hours upon hours! Once home, we had no fresh groceries in the house so Chris had gone to the local grocery store and arrived home right after my last meeting ended. She was pleased that I was able to help her unload the car! Six bags and $280.00 later, we were unloading the bags and determining what was going to be for dinner. Turkey burgers and fresh Asparagus; and since our Basil plants looked and smelled so great I suggested a Caprese salad to go along with it too. Alan’s bottle of wine had been sitting in my office and it was going to be tonight’s wine with dinner. Before the grill was even started I pulled the cork and grabbed my tasting sheet. 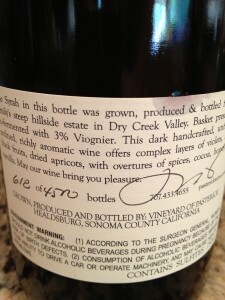 The Syrah was very aromatic and fruity and it smelled slightly sweet. I could smell ripe red fruit, spice with caramel and vanilla. It was slightly dry, but full bodied and slightly tart. The tannins were medium and a little astringent, but it was very flavorful and I believe it would best be served with food. 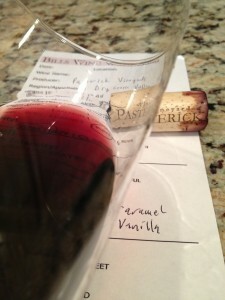 Some of the flavors were cocoa, big ripe red fruit, and slightly earthy and the finish was felt in my mid palate. How much: I’m not sure as it was a gift from Alan. I was not familiar with Pasterick wines. Reviewing the website they only make Syrah’s including a Rose’ of Syrah and Viognier. They appear to be a small production winery so I am sure you will get personal attention if you schedule a wine tasting. The next time we are in the Healdsberg area I plan on scheduling a tasting. Each bottle is labelled with its number and total bottles produced.